Citigroup recently held a workshop in combination with art experts from art business and auction house Christie's. The goal of the event was to train the heirs of large trusts on how to invest in the art business. These heirs are the beneficiaries of large trusts managed by Citi Private Bank, and while the purpose of the training was to help attendees understand investing beyond traditional securities, building and reinforcing relationships was clearly the primary motivation of the Citi's wealth managers. It's an important quest in that on average, private banking divisions lose about 50% of the assets they manage when the next generation takes over, according to a report from PricewaterhouseCoopers. The environment is similar in community bank trust departments. There too you find a significant decline in assets under management and a struggle to meet management objectives in terms of growth and profitability. Taking a look at the industry as a whole, the national trust industry has over $100T in assets, but 90% of those assets are custodial holdings for foreign institutional clients and are controlled by only 8 banks. Only 1%, or $1T is personal trust business that is spread among community, super-regional and money-center banks. Of the roughly 1K community bank trust departments, average assets under management is around $100mm. That number, though, is significantly skewed by some of the bigger banks. The median is more like $18mm. This is a problem because generally it takes about $500mm in assets and income of around $3mm for a trust department to be profitable. Why is that number so high? Providing trust services requires highly qualified personnel, supported by specialized accounting and back office functions. The trust function also needs to be separate from the bank, plus there are extra liability and regulatory considerations as well. There is also a generational shift driving the decline in assets, as the do-it-yourself Baby Boomers are inheriting the assets of their parents. This older generation tended to turn more towards banks for help in managing their affairs. Further, there is the issue of a change in tax laws, with much higher estate tax exemptions (in 2015, $5.43mm per individual or $10.86mm for a married couple). A full 99.8% of the estates in 2015 will not be subject to any estate tax, so there is less use of trusts for tax purposes as the estate tax now affects very few people. 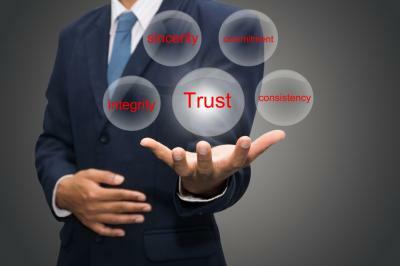 Still, there is a need for trusts and therefore for trust management. Trusts allow families to set up management over a lifetime for beneficiaries who would otherwise blow through an inheritance quickly. Also important, with more families split far and wide geographically, trusts allow for the management of life affairs in the case of an accident or disability which renders a person incapacitated for a period of time. Trust department assets are likely to continue to shrink, although there is probably still opportunity down the road as Boomers become less self-sufficient as they age. The traditional areas of expertise within community bank trust departments like eldercare and the management of life needs probably won't be available from online brokerage firms so opportunity exists. For community banks struggling with whether to keep their trust divisions operating or to spin them off, the choices won't be easy, as the choices are similar to others already in play. A certain size is probably required to survive, although that size is dependent upon the specifics of the institution. Success will require the effective leveraging of outsourced resources and leading edge investment products. What trust departments can provide if they are profitable, is a steady source of non-interest fee income. In the end, understanding how to run a trust department is like understanding the art market - specialized and not always profitable. Be sure your bank looks at the trust business from all sides, just as you might closely examine a fine painting. Treasury yields dropped 1 to 2bps in quiet trading as the market awaited today's employment report. A Bank Director survey finds the competitors that most worry bankers in order are Apple, Wal-Mart and online lenders like Lending Club. The Financial Times reports banking regulators have ratcheted up pressure on banks to move more energy credits into the nonperforming bucket as low oil prices continue to add stress to such borrowers. Bloomberg reports NYC has been the first city to finance a real estate hotel condominium project using a large piece of crowdfunding. Investors put in amounts as small as $100 for a total of $12mm overall of the $95mm project (or about 13% overall). Bankers should be aware, as money to fund projects can come from anywhere as you ponder the longer term implications of this. A survey by Brother International of small business owners finds 33% are looking at technology to support the internet of things and 30% would like to start accepting mobile payments from customers. Nielsen finds 93% of social media users say they believe recommendations from family and friends over any other form of advertising. Research by PricewaterhouseCoopers finds 79% expect to see steady growth in the next 5Ys and 70% say they have seen increased revenue growth in the past 12 months. The head of the IMF said global economic growth is slowing and will probably be weaker than expected, as China slows down, global financial conditions tighten and the Fed prepares to raise rates. The IMF projected in July a 3.3% global growth rate vs. 3.4% at the same time last year. Nielsen reports that consumers who learn about a product through social media channels are 43% more likely to buy.